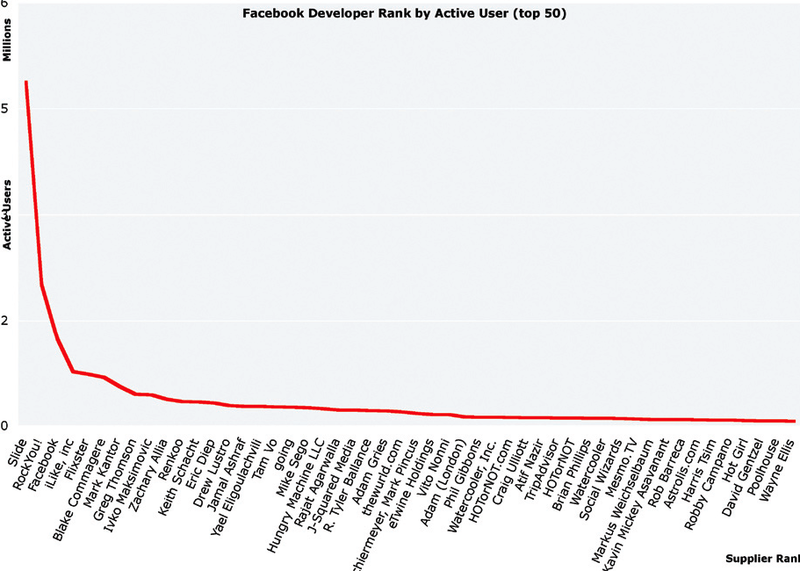 Every software developer these days seems to be working on a Facebook app, but relatively few get any traction. Tim O’Reilly reports that of the more than 5,000 Facebook apps available today, only 84 account for nearly 90 percent of all the usage. Of those, only about half boast more than 100,000 active users, and only three have more than one million active users. For instance, Top Friends has 2.8 million active users, FunWall has 1.9 million, and Super Wall has 1.1 million. Then it drops off to 500,000 by the No. 10 app (Likeness), and to 270,000 by the time you get to No. 20 (Scrabulous). Now, some of these apps may have become popular by notification spam or other questionable means, but that’s another story.